The Umbria is one of the Italian regions by the oldest and most important historical, folk, religious and art tradition. 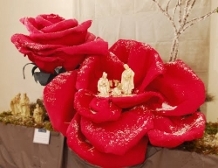 Is no exception one of the most important holidays of the year, Christmas, celebrated through the representation of the presepe (Christmas crib), conceived by S. Francis (Greccio, Rieti, 1223) and symbol of the Christianity. Among the many nativity scenes that are staged in this land, we point out an itinerary which includes the 5 most characteristic of the Lower Umbria, that deserve to be absolutely visited if you plan to spend the Christmas holidays in the Green Heart of Italy. Maybe staying in one of the charming farmhouses available. The stages are, from the point of departure to that of arrival, Orvieto, Massa Martana, Marmore Falls, Ferentillo and Cascia. Borghi (and places) beautiful and evocative. Recommended period to be able to admire them opened at the same time: from December 24th to January 6th. Departure from the City of the Rupe. Easily accessible via the E35 - A1, Orvieto needs no introduction. It reached its peak during the late Middle Ages, thanks to the protection of the Pope. But the city's origins are Etruscan. And precisely an Etruscan construction "rediscovered" in 1984 by Tersilio Sciarra, the Pozzo della Cava, hosts the Presepe nel Pozzo (Crib in the Well). The main feature, of course, is given by the setting, unique in its kind. The nativity scene is made within the last great cave of the archaeological complex, 14 meters deep. Animated by hundreds of life-size mechanical characters, which makes the performance even more outstanding. In addition the set-up, different each year, is made by experts of the theatrical and film special effects theatrical and film developing leitmotifs on the basis of a precise historical reconstruction of customs and traditions. Open every day from 09:00 to 20:00. Site: pozzodellacava.it. Presepi d'Italia - Massa Martana. From Orvieto we go now eastward, without going back on the A1 but taking, in succession ,the SS205 (up to Baschi Scalo) and the SS408. Along the way you will see, perhaps stopping, the Parco Fluviale del Tevere (Tiber River Park), a protected area by the WWF since 1990 including an internal stretch of the river and Lake di Corbara. Once you arrive at the Pontecuti hamlet, take the SS79bis. You will flank Todi, the city of Jacopone, rich in medieval monuments and always praised for its quality of life. A bus may not be a waste of time ... Keep going until you reach the Tiber SS79bis/Via Massa Martana. A stop may not be a waste of time... Keep going on the SS79bis/Via Tiberina road until you reach Massa Martana. The beautiful village, surrounded by the woods, annually hosts Presepi d'Italia (Christmas Cribs of Italy), a season of the crib art of national level (among the most important) but also internationally. The works (about 150, not only scenes of the Nativity, ed) are presented in 25 shops located inside the medieval walls of Massa Martana. Among the great attractions of Presepi d'Italia honorable mention for the "Presepe del Perugino", inspired by the "Adorazione dei Magi" of the divin pittore (divine painter), Pietro Vannucci, with natural size papier-mâché statues, by the master Prof. Francesco Invidia, whose ceremony dresses surprise for the rich folds of the drapery in paper and the red color rule the roost. Opening hours: every afternoon from 14:30 to 19:30 and, in the days of public holidays, even in the morning from 10:00 to 12:30. The Crib of the Waterfall. We leave behind Massa Martana, heading south, arriving at the train station, where we taking the E45/SS3bis towards Terni. "Easy" exits are Acquasparta and San Gemini (where nearby you will find the Archaeological Area of Carsulae, worthy of a "short visit"). You arrive until the city of St. Valentine, also called "The Italian Manchester" due to the presence of the steel mills (and the steelworks would cost a heavy bombing during the Second World War, 1943). To get to the Cascata delle Marmore (Marmore Falls), the third step of our journeys, you have two choices: take the SS209 immediately, the Valnerina road, and after about 7 km you will find the lower belvedere (viewpoint); or take the SS79, direction Marmore, for the upper belvedere. 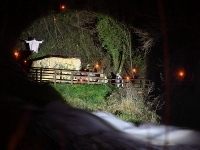 The Presepe Vivente di Marmore (Marmore Living Crib) is a "young" Christmas crib, born only a few years ago by the result of the commitment and dedication of the inhabitants. But surely fascinating: a natural frame of incredible beauty and charming for a cherished and engaging performance. For information on the days and times of performances, please visit presepedimarmore.it. 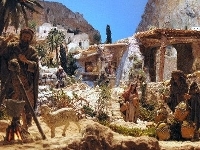 The Presepe Artistico di Ferentillo. To get to Ferentillo, lower Valnerina, if in the previous stage you have chosen the first option, the SS209, simply continue along the same road until Ferentillo. In the second case, go back to the junction of Papigno and go down a few hairpin bends until you reach the SS209. You might be interested in, on the way, Arrone, placed between The Most Beatutiful Villages of Italy, and Casteldilago. And the many opportunities to do outdoor activities such as rafting, canoeing and climbing. The Presepe Artistico di Ferentillo (Ferentillo Artistic Crib), housed in the Church of S. Maria, is nationally known and consists of a multiscenic representation narrating the passages of the Gospel of Luke, characters with great attention to details and very special scenic features such as, for example, lighting effects, smoke and various movements. The work, which in 2003 won the 10th edition of the National Christmas Crib competition "Praesepium Italie", is open every day ,from 15:00 to 19:00 on weekends and public holiday and 16:00 to 18:00 on weekdays (preferred reservation for the latter, ed.). Site: presepeferentillo.it. … and finally, the city of St. Rita. Get back on the SS209 and head north in the direction of Cascia - Norcia. Crossing the Valnerina you will pass by Scheggino, Sant'Anatolia di Narco, Vallo di Nera and Borgo Cerreto. Exceeded the latter town, you abandoned the SS209 and take the SS320, which will take you to Cascia. Here you will find the yearly traditional Rassegna dei Presepi (Festival of the Nativity Scenes), which collects nativity scenes of all types and sizes amongs churches, cellars and characteristic places of the old town centre of the borgo. The crib exhibition is organized by the local chapter of the "Mo.i.ca" and by the "Amici del Presepe Fabio Carbonari" association, which will also set up, in addition to the already known monumental nativity scene, a Christmas tree and a further artistic crib in front the church of San Francesco in order “to send a good sign of love and peace through the crib".